SCARY SYNOPSIS: What is the plot of this eerie episode? HALLOWEEN HORRORS: Any iconic Halloween imagery? 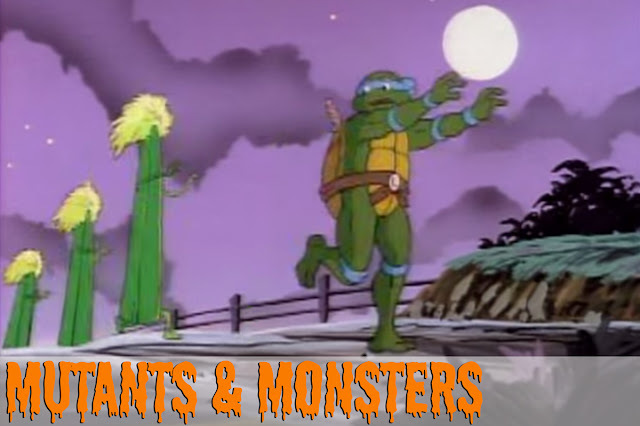 MONSTERS & MUTANTS: Crazy creatures? SPOOKIEST SCENE: A moment that gives me the heebie jeebies. BOO! CHEESIEST MOMENT: An eye-rolling moment that makes me giggle. 13 days. 13 episodes. 13 more reasons to love Halloween. 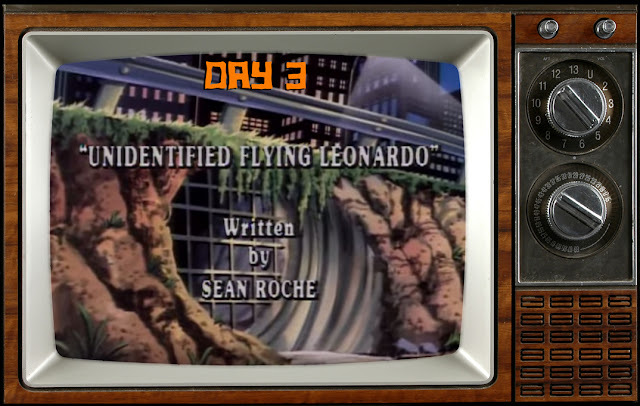 Let's take a trip to the country with Day 3 in Unidentified Flying Leonardo from Season 4! April investigates a scoop about UFOs in an upstate, superstitious farming town. Leonardo tags along and the locals mistake him for an alien from another planet. The leader in blue must avoid being hunted down by an angry mob of townies and a crop of killer vegetables! Unidentified Flying Leonardo starts off pretty lackluster. In the sewers, the Turtles are lazily watching a documentary on plywood. That doesn't give much hope for Halloween hijinks. But once Leonardo escapes the scene, the horror visuals are relentless. 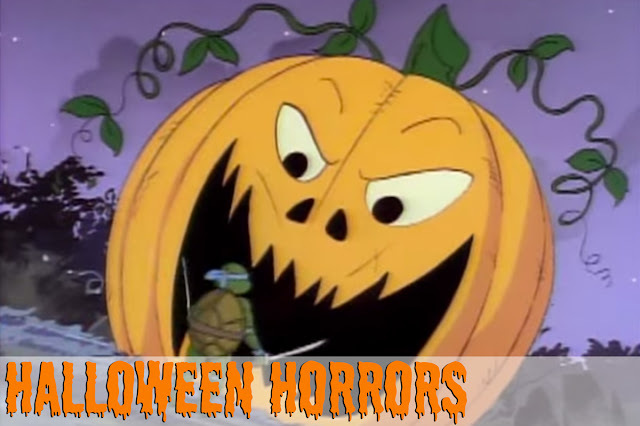 The episode is packed with spooky sights - cornfields, pumpkins, a scarecrow, local loons, a full moon, and an endless horde of twisted, Halloween-worthy enemies. If you're looking for outlandish villains this October, Unidentified Flying Leonardo will not disappoint. Leonardo battles a swarm of mutants and monsters. The first scuffle pits him against massive, fast-growing cornfields. The fearless later escapes the wrath of killer celery (equipped with limbs!). He even manages to duel against a giant, fear-inducing Jack O'Lantern. A seemingly infinite supply of creepy characters keep this episode ghastly. The giant, fear-inducing Jack O'Lantern. That monstrosity is certainly spooky. But, it's the innards that are even spookier. 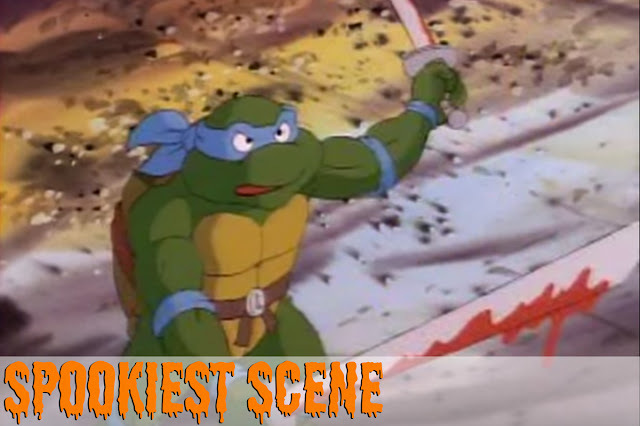 During his gauntlet against the Jack O'Lantern, Leonardo wildly hacks away with his swords at the villainous pumpkin. You'd expect pulpy, seed-filled clumps to fly from his weapons. But instead, the sharp metal cuts into the pumpkin and a red, blood-like substance splatters from the carving. It's a sinister visual that's pretty dark for a kids show. The escalation of zany, scary mayhem reaches insane heights when an army of huge tomatoes roll through town. 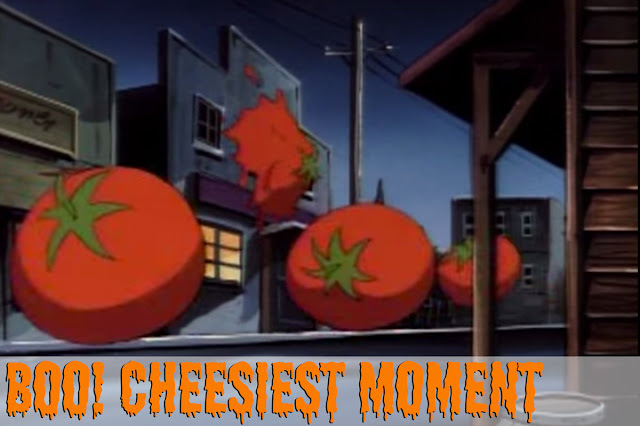 This scene is an obvious riff (that attempts no subtlety) on Attack of the Killer Tomatoes, another goofy cartoon that also aired in the early 90s. In Unidentified Flying Leonardo, two locals have a vocal exchange, adding to the absurdity. Local Dude 1: "What an incredible story - The Attack of the Mutant Tomatoes!" Local Dude 2: "It's already been done." The cartoon is very self-aware of its own silliness. 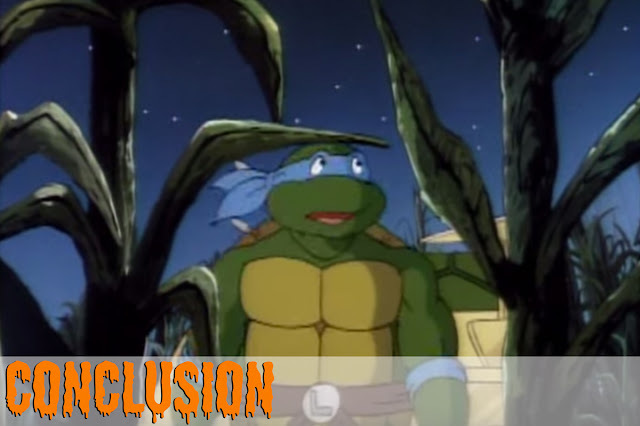 Unidentified Flying Leonardo is filled with blatant winks and nods to the Halloween season. Although the holiday is never mentioned, there's a real love for All Hallows' Eve. 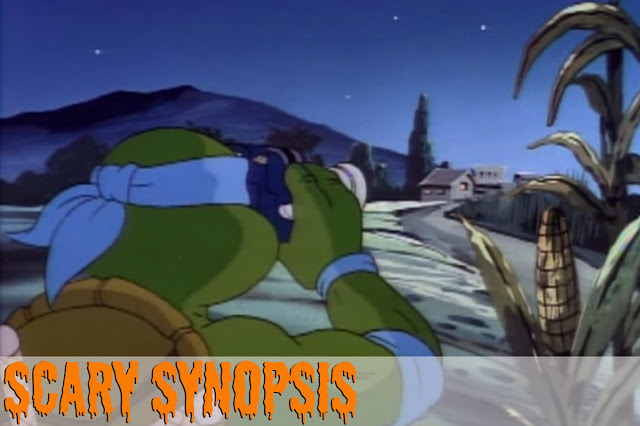 Check back tomorrow for Day 4 of Horrors In A Halfshell! I love holiday episodes from 80s & 90s TV shows. These are great for my Halloween play list. Keep 'em coming! Thanks Matt! It only gets sillier & spookier from here!